The only winners in the financial crisis that brought Detroit to the brink of state takeover are Wall Street bankers who reaped more than $474 million from a city too poor to keep street lights working. The city started borrowing to plug budget holes in 2005 under former Mayor Kwame Kilpatrick, who was convicted this week on corruption charges. That year, it issued $1.4 billion in securities to fund pension payments. Last year, it added $129.5 million in debt, 9.3 percent of its general-fund budget, in part to repay loans taken to service other bonds. Michigan Gov. 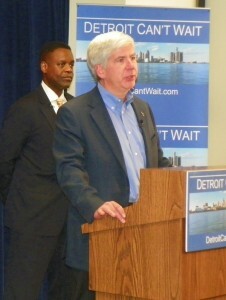 Rick Snyder announces appointment of Kevyn Orr as Detroit EM March 14, 2013. Detroit, which is trying to avoid becoming the largest U.S. municipal bankruptcy, struggles to serve residents after revenue declined when the auto industry collapsed and the city began to empty. Michigan ’s Republican governor, Rick Snyder, [has named] an emergency manager, who will have to address debt and derivatives taken on in the last eight years. Dave Sole of Moratoriun Now! speaks at rally against EM March 6, 2013. The city, which peaked at 1.85 million residents in 1950, has lost more than a quarter of its population since 2000. The 700,000 inhabitants who remain endure unreliable buses, inadequate police and fire protection and broken street lights that have darkened entire blocks. Banks including UBS AG (UBS), Bank of America Corp.’s Merrill Lynch and JPMorgan Chase & Co (JPM) have enabled about $3.7 billion of bond issues to cover deficits, pension shortfalls and debt payments since 2005, according to data compiled by Bloomberg. Liabilities rose to almost $15 billion, including money owed retirees, according to a state treasurer’s review. The debt sales cost Detroit $474 million, including underwriting expenses, bond-insurance premiums and fees for wrong-way bets on swaps, according to data compiled by Bloomberg. That almost equals the city’s 2013 budget for police and fire protection. 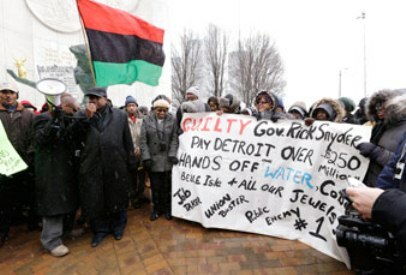 Protesters rally outside CAYMC in Detroit as EM takes office March 25, 2013. The largest part is $350 million owed for derivatives meant to lower borrowing costs on variable-rate debt. Municipal borrowers from the Metropolitan Water District of Southern California to Harvard University in Cambridge, Massachusetts, have paid billions to banks to end interest-rate swaps that didn’t protect them. In the bets, a municipal issuer and another party exchange payments tied to interest-rate indexes. 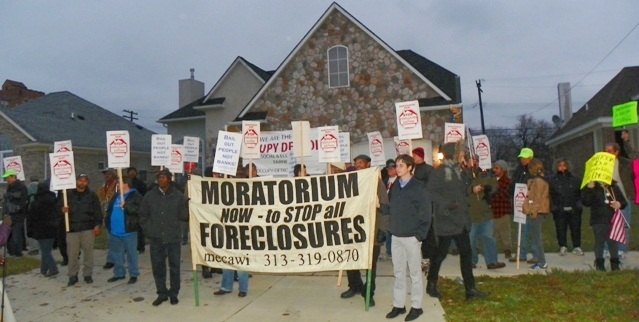 Moratoriun Now and Occupy Detroit protect the home of a Detroiter facing foreclosure. As banks were collecting fees from bonds, some targeted city homeowners with subprime loans that led to foreclosures, depressing real-estate values and tax revenue, Sole said. About one-quarter of Detroit’s housing units are vacant, according to Detroit Future City, a 50-year blueprint for recovery. In some areas, entire blocks are deserted. Properties have been stripped of plumbing, wiring and whatever can be sold. The home town of General Motors Co. (GM) has been running general-fund deficits of $155.4 million to $331.9 million since 2005, when Kilpatrick was mayor, and has been firing workers to save money. Last year, it cut police staffing by 11.6 percent to 2,836, according to budget documents. Killings spiked. Detroit had 411 homicides last year, up 9 percent from 2011. 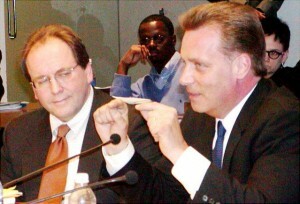 Stephen Murphy of Standard and Poor’s (r) and Joe O’Keefe of Fitch Ratings sell Detroit City Council on %1.5 billion UBS AG loan in 2004. 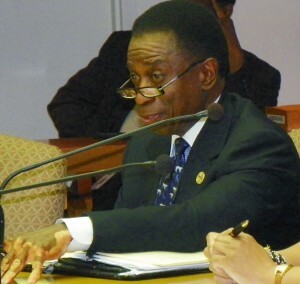 On March 11, Kilpatrick, a Democrat, was convicted on corruption and fraud charges. He and co-conspirators executed a “wide-ranging racketeering conspiracy involving extortion, bribery and fraud,” U.S. Attorney Barbara McQuade said in a statement. Kilpatrick’s attorney, James Thomas of Detroit, declined to comment. While his client ran Detroit, the city embarked on two of its most expensive bond issues, first paying $46.4 million in fees to UBS and others to borrow $1.4 billion for pension obligations. A year later, the city paid $61.8 million, including insurance costs, for UBS to sell $948.5 million in bonds, replacing two-thirds of the debt sold the previous year. Some pension debt traded at about 65 cents on the dollar in the most recent trade Feb. 12, according to data compiled by Bloomberg. Detroit also entered into swaps contracts with UBS and SBS Financial Products Co., which serves as a counterparty on swaps transactions. The arrangements are a bet on the direction of interest rates and can raise costs if they move unexpectedly. Detroit CFO Jack Martin Aug. , 2012. Rates fell, leaving a liability of $439 million on June 30, 2012, according to a city report. That has fallen to about $350 million as rates went back up, said Jack Martin, Detroit’s chief financial officer. The city makes periodic swap payments from money generated by casinos. Wall Street firms could end the deals and call for full payment because Moody’s Investors Service last March cut unlimited general-obligation bond ratings to B2, five levels below investment grade, according to the city’s 2012 financial statement. In November, Moody’s cut the rating again, sending it down two levels to Caa1. The cuts mean there is “significant risk in connection with the city’s ability to meet the cash demands” under the swap, according to Detroit’s financial report. The city has been talking with holders of its swaps, the report said. Martin said no negotiations are occurring. Banks have been reluctant to negotiate lower termination payments for many municipal governments. Last year, Detroit’s water and sewer utility borrowed to pay more than $300 million to unwind swaps. Karina Byrne, a spokeswoman for Zurich-based UBS, declined to comment on the deals. Elizabeth Seymour, a spokeswoman for New York-based JPMorgan, also declined to comment on them, as did Thomas Butler, an SBS spokesman who works for New York-based Butler Associates LLC. After the pension bonds, the city continued to issue general-obligation bonds and short-term debt totaling about $1.3 billion, according to data compiled by Bloomberg. The city ran into “liquidity problems,” according to the 2012 financial statement. Because of low ratings and deficits, it was unable to borrow and turned to the Michigan Finance Authority, which arranged a $129.5 million bond issue underwritten by a Bank of America unit. Costing $1.6 million in fees, part of the proceeds went to repay the unit for an earlier $80 million loan — and part of that loan had been used to service other debt, according to the financial statement. William Halldin, a spokesman for Charlotte, North Carolina- based Bank of America, declined to comment on the deal. An emergency financial manager will have to handle the legacy of Detroit’s borrowing. Snyder said March 1 that the official would try to restructure long-term debt and renegotiate payments. Striking new terms would be difficult, said Rick Frimmer, a corporate and municipal restructuring specialist with Schiff Hardin LLP in Chicago who represents some of the debt holders. Temporary changes may be possible, he said, such as waiving payments or default terms. The city has advisers working on a plan to deal with the debt, in part by reducing retiree health-care liabilities, said Martin. He declined to comment on fees negotiated before he joined the administration. 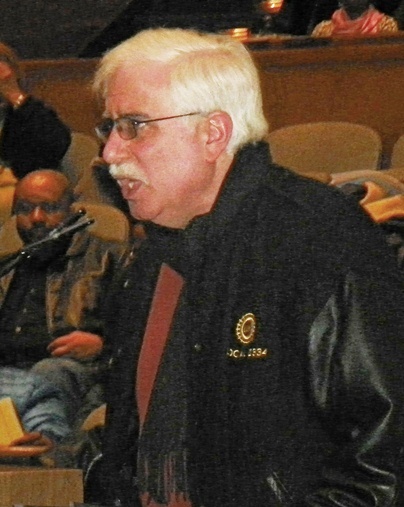 “I’m sure the fees and interest rate are what most other local units or school districts would have to pay,” Martin said.